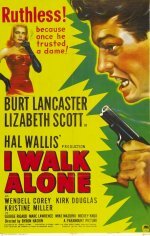 Burt Lancaster and Kirk Douglas (both still relative novices here) give solid performances in this bruising film noir about ex-bootleggers who fall out over their spoils. Wendell Corey also impresses as the spineless accountant, who is murdered after helping Douglas build his empire while Burt is doing time. Based on Theodore Reeves's play Beggars Are Coming to Town, the action is kept nicely on the boil by director Byron Haskin (a former cinematographer and special effects man), who handles the violent set pieces, the romantic interludes and the musical numbers with equal assurance.